I have a little something to get off my chest. I am fit to be tied about this whole thing with DACA and Dreamers. The latest immigration bill that Trump will support would allow 1.8 million “Dreamers” to stay and pursue a path to citizenship. Think of that — 1.8 million. I believe there are about 690,000 that should have been included, but for some reason it’s been bumped up to the 1.8 million. Granted, Trump wants the wall, and he wants to end chain immigration and the visa lottery. That’s admirable. We need to do that. You’re not a country if you don’t have enforceable borders. That romanticizes what they really are: unlawful, illegal immigrants. I do feel bad that they were brought here by their law-breaking parents. But ever heard the adage 2 wrongs don’t make a right? They might have been brought here by their law-breaking parents, but we don’t fix that by breaking the law continually and allowing them to remain here without a legal process. No matter what you say and how much empathy you whip up, the simple fact remains that these people are here in our country illegally. If — and that’s a big if— they REALLY want to be Americans, and by want to be Americans, I don’t mean conning to get all the free stuff, free healthcare possible. They are trespassing. They absolutely are. Nobody would allow that! Yet we allow it here in the United States of America. If they really want to be Americans, they should go home and begin the process that millions before them have undergone. They should come here legally. They should be productive and NOT take free stuff. They should learn English and eagerly assimilate into America’s culture. That means no demanding we celebrate Cinco de Mayo, which is pretty much a fake holiday that is not even celebrated, or little celebrated in Mexico. I talk a lot about being the granddaughter of legal Norwegian immigrants. I’m proud of that. I’m proud of my Norwegian heritage. I don’t begrudge anyone being proud of their heritage. That’s part of what makes us a fantastic nation, especially if we say we’re Americans first. My Grandpa Ole came from Norway by himself at age 15. Let me repeat that: Grandpa Ole came from Norway by himself at age 15. He was a dreamer. He dreamed of making a life for himself in America. He had an aunt to stay with while he attended a one room school house so he could learn English and all other subjects necessary to take the test to become a Naturalized citizen. My grandpa Ole would not see any of his family in Norway for 40 years! But he was willing to make that sacrifice to be an American. I learned my work ethic from my grandparents, who worked hard six days a week, always taking one day off for church. I know some Norwegian because I implored Grandpa to speak with me. More often than not he would remind me we were Americans and should speak English. I have other friends with tremendous immigration stories. Stories of hardships endured so they could be Americans. For instance the Kellers who came from New Zealand. Mr. Keller had been captured and put in a concentration camp in the South Pacific during World War II. He was liberated by Americans. He dreamed of living in America and brought his entire family years later. It took two years of hardship, but they arrived and became naturalized citizens. He spoke so much about what they owed this country that his four boys all joined the military when they were old enough: two joined the Navy, two joined the Marines. The point being, we are a nation of law keepers, not law breakers. Illegal entrance is the antithesis of a Constitutional Republic that is a nation of LAWS. My Grandpa had a dream that his children and grandchildren would be good, hardworking Americans. 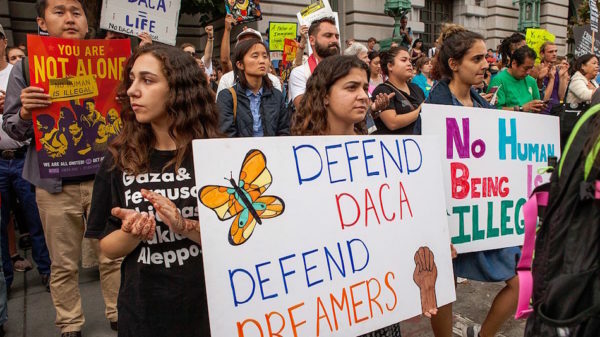 Calling DACA folks Dreamers cheapens the sacrifices made by millions of legal immigrants to this great nation. I have a dream that I don’t ever have to push 1 for English in my own country. I have a dream that American kids won’t be punished for wearing t-shirts with American flags or the Second Amendment. That’s the kind of dreams I have. And I hope you join me in supporting that dream.